The world of vaping doesn’t make immediate sense. Whether you want to vape plant matter, wax, or e-liquids, you probably want to do some research before you start dropping cash on mods. Don’t worry, though. We did the research for you. The most common type of vaping involves heating up flavored oil, also known as e-liquid. You can also vape plants and wax—more on this in a second—but every aspect of e-liquid vaping alone seems to require a handbook. From the devices to the lingo to the vast library of liquids you’re vaporizing, what you need to know can be found in this ultimate guide to vaping. Vaping is the inhalation of any substance that is superheated into a delicious and intoxicating vapor. With weed/wax/shatter vaping, you’re heating the substance so the THC and other cannaboids are vaporized, but never burned. 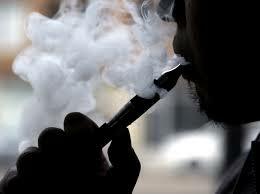 With e-vaping your vaporizing flavored propylene glycol or vegetable glycerine, usually with some nicotine thrown in. Enthusiasts use the umbrella term e-juice for both. The vape is the thing that does the vaporizing. There are a lot of vapes on the market. Some vape every substance that can be vaped, while others are limited to specific materials. There are egos, or vape pens, which are a step above e-cigs (though, confusingly, often called e-cigs as well). They look like an oboe, and tend to be the cheapest vapes available—they’re also the most widely used for e-vaping. Mods look like a cross between an oboe and a taser and are where much of the vaping community focus their energy. They’re known for their insane customization and their complete lack of new user friendliness. There are also weed vapes. They don’t really have any special name, but if you Google vapes they’re always at the top of the list. Some vape flower (bud), others wax, and others both. Some even vape oils—both of the cannaboid and nicotine variety. The majority use e-juice. What do you smoke in a vape? You can smoke weed, wax or shatter, but most people smoke e-juice which is legal-in all 50 states. In the modding community, flavored nicotine “juices” are especially popular. They start at 0mg of nicotine and climb up to 9mg or more. If you’re new to vaping I’d suggest starting low, at 0 or 3mg. Nicotine increases the “harshness” of the vapor which can lead to nasty coughing fits and feeling like you’ve been trying to inhale exhaust fumes for the last hour.It also hits your system very differently than nicotine from a cigarette. So it’s very easy to process too much nicotine. That will lead to nausea and a general sense of being unwell. The UK government claims that vapes are 95-percent less harmful than traditional tobacco products. Which isn’t exactly difficult. Cigarettes are death wrapped in white paper and loaded with carcinogens. You could probably make a similar claim about the lethality of cigarettes versus guns, cars, or Chernobyl’s elephant foot. But vapes are still harmful compared to complete abstinence from smoking (and increasingly popular with the precious pink lung meats of teens). Which is one of the reasons the FDA has banned their sales to anyone under the age of 18. They can also contain some…not great ingredients: like formaldehyde or diacetyl. That’s led the FDA to add a clause to their new rules to require all vaping products (including e-juices) be submitted to the FDA for approval. Which should hopefully cut down on the instances of popcorn lung. Popcorn lung is another name for obliterative bronchiolitis, a type of irreversible lung disease that can, in severe cases, require lung transplants. The name popcorn lung comes from an incident in which eight employees at a popcorn factory in Missouri were diagnosed with obliterative bronchiolitis. They contracted the disease due to their work with diacetyl, a flavor enhancing chemical found in artificial butter. It’s also found in a number of e-liquids, particularly those with strong fruit or candy flavors. While a single puff of a vape containing diacetyl won’t cause damage, repeated extensive use can. So don’t be afraid to try e-liquids containing diacetyl, but do be wary of continuous use. Okay, but what about exploding batteries? It seems like there’s a report of another exploding e-cig every other week. We’ve been covering the issue since as early as 2012. Batteries used in vaping are lithium ion batteries, and lithium ion batteries can be subject to the cool component of chemistry known as thermal runaway. When the batteries are overcharged, overheated, or punctured they build energy rapidly until they explode. Vaping puts those batteries right next to a super hot heating coil, which makes them ripe for accidental thermal runaway if they’re poorly constructed. And a lot of people aren’t mindful of the voltage they’re charging their batteries at—which can lead to overcharging and, again, accidental thermal runaway. Using high-quality batteries and being mindful of what voltage they should be charged at will greatly reduce instances of e-cigarettes exploding in your pocket. However, some numb nuts like to see the world burn. There are vape modders who like to use “unregulated” mods for vaping. These mods are ridiculously simple to use, but if the set up isn’t perfect the battery can overheat and, again, thermal runaway. Unless you are an expert in electrical engineering it’s probably better to stick to regulated mods. Why is it called modding? In the beginning vaping was done exclusively through egos, but brave vapers said “we can make these battery packs better” and began to mod them. It eventually spun off into its own subset of vaping, and while most mods are now bulk manufactured, the name has stuck around. They’re popular because they’re incredibly customizable. What the hell is a mod vape? Battery Mod: This is the box at the bottom. Depending on the mod it can hold up to three batteries—the traditional being a 16850 rechargable battery. Temperature, wattage, ohms, and volts may all be reported/controlled here. Tank: This holds your e-juice. They can start out very small—some only hold a couple of mL—and they can get very big. I’ve seen tanks that hold over 10mL. Wick: If you heat the e-juice directly, you will have a potentially unpleasant experience. Wicks absorb the e-juice and carry it to the heating element. They can be made of a lot of different substances though cotton and silica are the two most common. Drip Tip or Mouthpiece: The tip that you smoke out of. There are a lot of tips out there and they’re made of a lot of substances: from pyrex to glass to steel to simple plastic. Atomizer: Many people (me) don’t want to fuss with finding a specific coil, wick, tank and drip tip. Atomizers are all four components sold together. To get to vaping you screw your atomizer into you battery mod, fill up the tank, and puff away. My mod has temperature control, so why do I need to care about ohms, watts, and volts? This was one of the most confusing aspects of vaping for me. Most mods have temperature control which should, theoretically, allow me to control how hot the vapor gets. So why do all the sites spend their time obsessing over batteries and watts, ohms, and volts? “We can’t really control ‘temperature’ despite what all of the ‘temp control’ devices on the market say,” says Lance Wallen, a vape expert also known as SteamMonkey in the vaping community. Controlling the temperature is difficult. You’ve got the heating element maintaining one temp, the e-juice evaporating to another, and the air from outside the vape contributing as well. To consistently and accurately gauge the temperature of the vapor the vape would need to be a lot larger and more expensive. “What actually happens in “temp control” devices is they utilize the resistance curve of the wire being used and do some math,” says Wallen. Oh my God, vaping requires math?! Yes, it does. “Power is king when it comes to vape performance,” notes Wallen. While it feels like you need a background in electrical engineering, really you just need to know a few things. First up are watts. The higher the wattage of the atomizer the hotter the atomizer gets. Higher temps mean, theoretically, better vape clouds. But if they’re too hot then you’re going to burn your lungs when you inhale. Most vape enthusiasts look for watts between 4 and 9. To control the wattage you can adjust two aspects that work in tandem. The resistance of the coil is measured in ohms. Lowers ohms means it will require less voltage from the battery to get the desired watts. That’s where the math comes in. Squaring the voltage and then dividing by the ohms of your device will give you the watts you’re smoking at. But when you’re in the store trying to pick up new coils with the desired ohms or buying a new battery mod you don’t need to be thinking about math. So here’s a helpful chart. As long as you stay in the green you’ll have what’s considered optimum vape. But remember, the hotter it gets, even if it’s deeply unpleasant to your lips, the bigger the cloud. So some people ignore the chart to chase the clouds. That’s where sub-ohm vaping comes in. Sub-ohm vaping? The chart says that means death! If your try to sub-ohm vape with a traditional atomizer it will be deeply unpleasant, and likely destroy the coil in your mod. Sub-ohm tanks are built with the high temps in mind. They allow a great deal more air to flow into the tank. That cools things off while giving you a larger cloud of vape. So if you’re deeply invested in “chasing the clouds” and prefer something a little warmer, to better mimic a traditional cigarette, than sub-ohm vaping is for you. Vaping—especially mod vaping—is all about customization and it can be incredibly overwhelming. So start slow. Get friendly with your local vape store (yes they’re everywhere—including rural areas). Don’t be afraid to ask questions. The people at those local vape stores will be eager to answer them! Mainly just get to vaping—if you so choose.